Interior Secretary Ken Salazar, affirming a decision of the U.S. 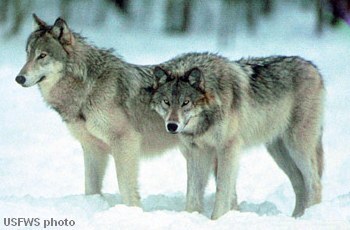 Fish and Wildlife Service (USFWS), has removed the gray wolf from protection under the Endangered Species Act (ESA). However, this ONLY applies to Idaho, Montana, the Western Great Lakes, and some (but not all) areas of Washington, Oregon, and Utah. Wolves in other parts of the 48 states, including the Southwest states, remain endangered and are not affected by Salazar’s ruling. Wolf hunters should check carefully to ensure that the area(s) where they intend to hunt are not subject to ESA controls. Wolves in Wyoming remain specifically protected. In making the announcement, Secretary Salazar reviewed the numbers behind the decision. “When it was listed as endangered in 1974, the wolf had almost disappeared from the continental United States. Today, we have more than 5,500 wolves, including more than 1,600 in the Rockies,” Salazar said. Gray wolves were previously listed as endangered in the lower 48 states, except in Minnesota where they were listed as threatened. The USFWS oversees three separate recovery programs for the gray wolf; each has its own recovery plan and recovery goals based on the unique characteristics of wolf populations in each geographic area. Share the post "Hunting News — Gray Wolves Removed from Endangered List in Some Regions"